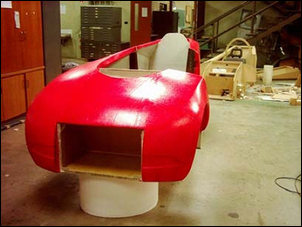 Last week in Building an Ultra Light-Weight Car, Part 1 we looked at how the University of South Australia has built the monocoque tub of an ultra lightweight and innovative, three-wheel electric car. 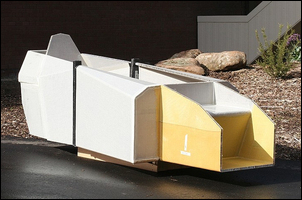 Rather than using a steel or aluminium tubular space-frame structure, the strength of the vehicle lies in a monocoque constructed from foldable, aluminium honeycomb/fibreglass sandwich panels. That approach resulted in a complete tub that weighs just 32kg yet has room to carry two people. But yes you’re right, it doesn’t look very aerodynamic, does it... 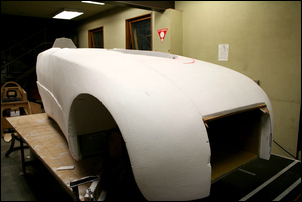 So in this story we look at how the monocoque was clothed in aerodynamic bodywork, a process that before paint, added just 13kg! Adfoam ‘M’ grade modelling type expanded polystyrene blocks were cut and then epoxy’d to the fibreglass/aluminium sandwich panels. (Go to www.adfoam.com.au for more details on this foam.) 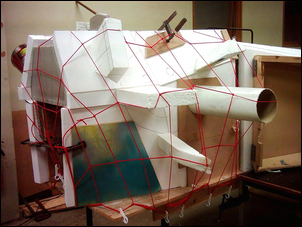 While the epoxy was curing, the foam was held in place with an elastic trailer cargo net and various props. 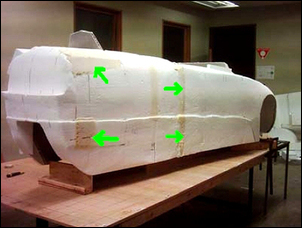 ... and greater thicknesses used where extensive curvature was needed. The individual foam blocks were shaped so that clearances between adjoining foam blocks were minimal. 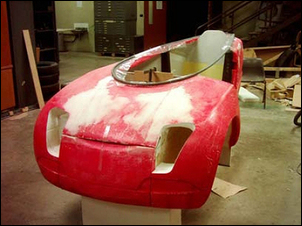 ...and then a second layer of fibreglass and resin was applied, the latter complete with red pigment. Sanding then followed. The red pigment acted as an indicating coat, showing the depth to which the sanding had penetrated. 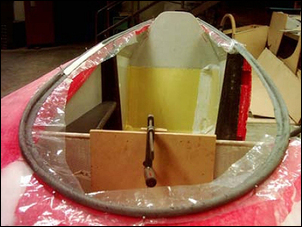 A carbon fibre reinforcement hoop was installed on the upper surface of body; the acrylic canopy (to be covered in a moment) rests on this. 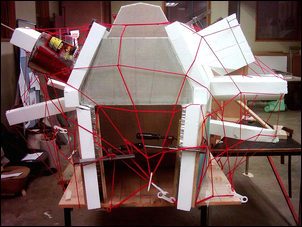 The canopy edge was reinforced with carbon fibre tape laid over plastic polypipe. ... the openings for the front lights, the latter being done with a jigsaw. 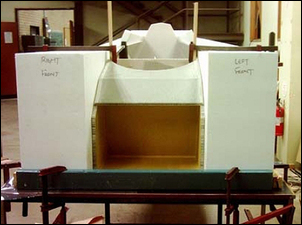 These exposed foam areas were then fibreglassed. 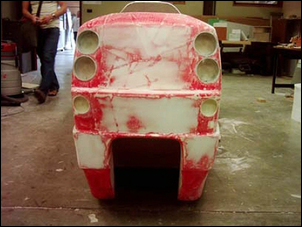 The body then went to a professional spray shop where the body was further smoothed using body filler and then painted. 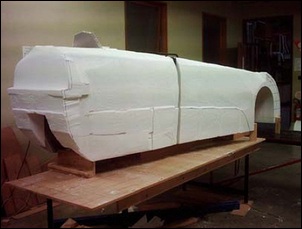 The additional mass of the foam and fibreglass body was 13kg; painted and smoothed, this increased by another 9kg. The plastic canopy was made from 3mm clear acrylic. 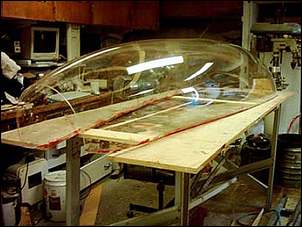 It was free-blown but a template was developed that delineated the shape of the plastic blank; this was mathematically modelled so that the free-blown shape would result in a bubble from which the correctly shaped canopy could be cut. 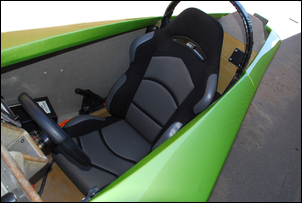 The canopy was blown by Ian Linke of Aviation Acrylic Mouldings, a specialist in blowing canopies for gliders. The canopy weighs 10kg. 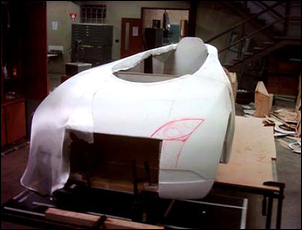 Final trimming of the canopy was made on the body of the car. The canopy is hinged at the rear but plans are afoot for a change to side hinging. 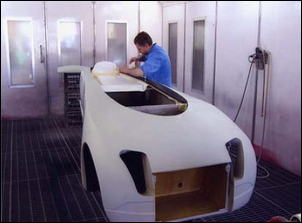 The most fascinating aspect about the construction of the University of South Australia’s car is that with the exception of the canopy blowing and final painting, the constructional techniques can all be done by amateurs working with just hand tools. There’s no need for welding gear, building moulds or panel beating. There’s not even a requirement for a large workspace. The exterior body techniques lend themselves to custom, compound curve shapes, and the monocoque chassis can be as heavy duty (or as light duty) as the requirements demand. And the Car as a Whole? 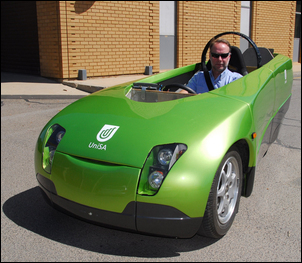 As we’ve indicated, the most impressive feature of the University of South Australia’s car (they call it ‘Trev’) is its body design and construction. But what about the rest of the car? In short, it’s largely a build in progress. 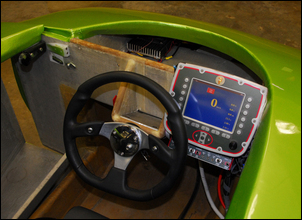 The car is currently powered by a 6000 rpm, brushed DC electric motor driving the rear wheel through a two-stage drive belt reduction. 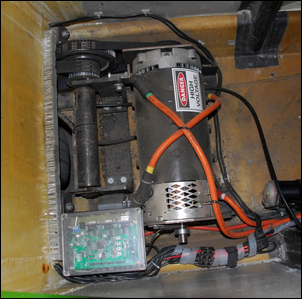 The motor is powered by a 45kg lithium ion battery pack, giving a range of 120 kilometres. A commercial power controller is used. 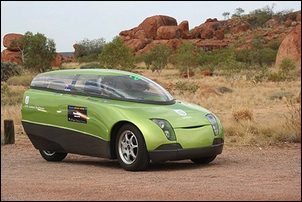 In this form, the car has completed the Darwin to Adelaide World Solar Challenge, running in the Greenfleet Technology Class. 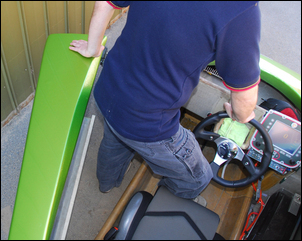 We were able to drive the car around the roads of the Mawson Lakes campus. Unfortunately (or fortunately?) for our drive, the car could not be equipped with its canopy. The car shows enormous promise. The steering is light and direct and the performance excellent. (The claim is for a top speed of 120 km/h and 0-100 km/h in around 10 seconds, but with the instant electric motor torque, it feels faster-accelerating than that.) But the low-speed throttle control is dreadful, completely destroying the refined feel that would otherwise be associated with the electric motor. 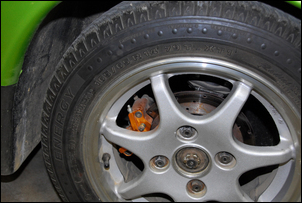 The ride quality from the front wishbones and rear trailing arm (sprung and damped with motorcycle units) is fine on smooth surfaces but on rough surfaces, the suspension shows severely inadequate travel. Corner hard and then pass over a bump and the result is simply awful. The brakes are so bad it’s easy to assume they’re not connected. The interior of the car is more of that ‘work in progress’ without a proper dashboard or interior trimming. To our way of thinking, the current dashboard LCD is over-kill – although the intention is to add a rear-view camera, which would give a better reason for its presence. Other on-board electronics are overly complex - including a whole computer system to control just the lights! But what works well, works very well. Considering the overall dimensions, interior space is excellent. The rear-hinged, wide door and the heavily cutaway floor combine in a design master-stroke – an adult can easily get into the back seat (or where the back seat would go if the car currently had a back seat!) and access to the driver’s seat is straightforward. There’s a huge amount of room in the doors and the dash panel is spacious, although the storage space in front of the dash is inaccessible. Luggage room is just a little tight – not much is needed in a car of this type but it could probably be better optimised. Incidentally, program director Peter Pudney is well aware of these deficiencies. But instead of thinking of what the car is like now, think of what a car could be like! Start by fitting decent, long-travel suspension (perhaps air springs would be best) and a stiff anti-roll bar (remember, the back wheel provides zero roll stiffness!). A real car of the future.